This series will be a Lego stop-motion series based on the DC Comic book character, Aquaman. It will take place in my Lego DC Universe, and I will be writing the script, however, I will not be animating this series as I am already working on a Batman series. This Aquaman series will be animated by Lego Master Productions. The story takes place shortly after Arthur Curry's dad, Tom, passes away from cancer. Feeling upset that he couldn't help his father, Arthur decides to use his 'gifts' to help others. So he decides to investigate when a LexCorp truck filled with chemicals, is dumped and leaked into the waters of Mercy Reef. His actions capture the attention of his mother, whom he believes dead, but is in fact the ruler of the mythical city, Atlantis. Keep in mind, this is apart of a larger continuity/universe, so for some of the roles, you may be asked to come back for future projects, or possibly a future season. In terms of schedule, the animator, Lego Master Productions, tends to get his animations done pretty fast, so a quick turn-around on the lines would be greatly appreciated. However, feel free to take as much time as you need, or as you feel necessary to get the lines done well. As of this casting call being published (Oct. 20), the script has not yet been written, so more characters may be added. If this is the case, I will keep updating the casting call regularly. Thank you again for your consideration in taking part in this project. I really look forward to making this along with Lego Master Productions, and I hope you guys are interested to be a part of it. Arthur Curry discovered he had unusual abilities at a young age. Now, after the passing of his father, he decides to use those abilities to help others. Crossing paths with the likes of Lex Luthor and Killer Croc, brings the attention of his mother, whom he thought died when he was a baby. She decides to introduce him to his true home, Atlantis, where he is heir to the throne. A deep, profound, masculine voice with a North American accent. I am Aquaman. The king of the seven seas. This is my birthright. This is my responsibilty. And I will embrace it. Sooner or later....king or hero....my hand will be forced and I'll do what I originally set out to do. I know the oceans better than anyone, but they're still full of secrets, even to me. Waylon Jones is a marine biologist living in Mercy Reef. One day he is diving amongst the corals, when a truck full of chemical are spilled into the water. These chemicals from LexCorp transform Jones into the creature known as Killer Croc. He eventually crosses paths with Aquaman in a quest to destroy whoever did this to him. Croc has a very deep, monstrous voice. I'm gonna' find whoever did this to me, and I'm gonna' rip his head right off of his neck! You are my eyes, above the surface. And I am the deadly jaws beneath it. Cal Durham is Arthur Curry's best friend. Being technologically-savvy, he even helps Arthur track down the guy who spilt the LexCorp chemicals. Cal has a deep, adult, masculine voice, with an African-American accent. Arthur, you know I'll always have your back, no matter what. So whatever it is that you need to do, just do it. And I'll be here for you. Dude, you're gonna want to see this. There's a huge crocodile-guy running around out there. Atlanna is the queen of the underwater, mythical city of Atlantis. She left the surface after having a child, Arthur Curry, and returned home to rule Atlantis. Arthur believed that she died whilst he was a baby, but his father could never tell him the truth. Now, after learning of his battles with Killer Croc, Atlanna decides to bring Arthur home, to Atlantis, to become heir to the throne. Atlanna has an older, wiser, female voice. You my son, shall carry on the heritage of Atlantis, for you have the power to become ruler of all of the seven seas. Mera is an Atlantean working for Queen Atlanna, alongside Atlanna's son, Orm, to whom she does not work well with. Mera regularly keeps an eye on Arthur Curry (as requested by Queen Atlanna), and informs the queen of his fight with Killer Croc, prompting Atlanna to bring Arthur home, to Atlantis. My name is Mera of Atlantis, and I come with a message from Queen Atlanna. Don't be like the rest of the world, Arthur. Don't undervalue who Aquaman truly is. Orm is the son of Atlanna and half-brother of Aquaman. He strongly opposes Atlanna's idea to bring Arthur Curry to Atlantis, as it is against tradition to bring a surface-dweller to Atlantis, and because Arthur's presence would make him heir to the throne, instead of Orm. He tries to prevent Arthur's arrival by any means necessary, no matter how violent. We cannot allow a surface-dweller, such as Arthur Curry, to come to Atlantis. It goes against all of our rules and traditions, and we would be exposed to the entire world. I have returned, dear half-brother. And before this day is done, I shall be king....and you shall be dead. 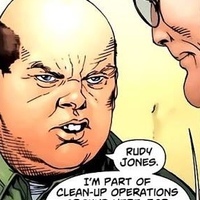 Character: Rudy Jones is a janitor working for LexCorp. He has only a minor role in this episode with only a few lines. Voice: Adult, male, with an American accent. Hey. You must be new here. My name’s Rudy, and I’m you’re new boss. Character: Lex Luthor’s body guard is only a minor role, with only a few lines in the episode. Voice: Adult, male voice. Accent doesn’t matter. Excuse me, sir. I’m going to have to ask you to leave the area. If you do not leave now, I will be forced to throw you out of here.